START’s administrative offices and interdisciplinary student space is located in the Harris Hydraulics Laboratory on the University of Washington campus, minutes from the UW Medical Center. 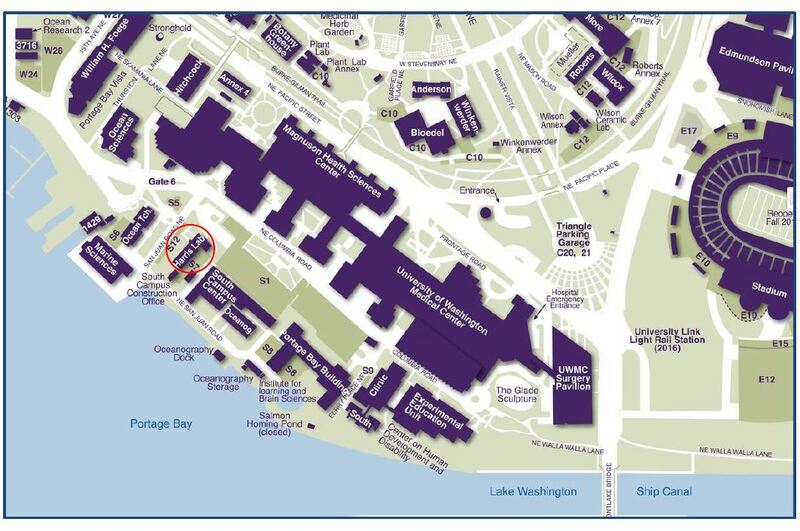 Please see Harris Lab circled on the accompanying campus map. 1. From Interstate 5, take the NE 45th Street exit. 5. Go approximately 7 blocks crossing the NE Pacific Street intersection. 6. At the stop sign at the bottom of 15th Avenue NE bear left onto NE Boat Street which becomes Columbia Road. 7. You will arrive at a UW parking gatehouse, where university guests pay for campus parking. From here, take an immediate right onto San Juan Drive. Harris Hydraulics will be to the left. Buses that stop in front of the UW Medical Center at NE Pacific St. and NE Pacific Pl. may include King County Metro: 25, 43, 44, 48, 133, 167, 271, 272, 277. Express bus routes, including the 48, 205, 540, 556 and 586, also stop at UW Medical Center. The UW Health Sciences Shuttle transports passengers to and from Harborview Medical Center and the UW Medical Center, free-of-charge. To access Harris Hydraulics, it is recommended to disembark prior to the Magnuson Health Sciences Center on NE Pacific Street, walk through the rotunda cafeteria to the right of the Magnuson Health Sciences Center, exit onto Columbia Road and proceed onto San Juan Drive. Recommended parking for Harris Hydraulics is Lot S1, if space is available. The S1 parking garage entrance is on San Juan Drive. There is also paid street parking available, prior to entering the UW Parking Gatehouse.